Where to buy Nehru jacket online? Nehru jacket is a coat worn by both men and women that resembles a sherwani or achkan. It is a hip-length coat with a mandarin collar. It has a cultural evolution as India had been influenced by various invaders hence the lifestyle has also evolved accordingly. The Nehru jacket has evolved since the 10th century but that garment was not worn as a half suit. It was worn as shirts under a full-length coat and not solely as a coat. The design kept on changing and it was inspired by the frocks worn by the Mughals which were called ‘Kurta’ and was paired with a waistcoat or full-length coat. The kurta also evolved and with some changes was known by the name ‘Achkan’. Achkan is popular in present times as well. Achkan or Sherwani are popular among the Indian and are worn in festive occasions giving an ethnic look. Nehru jackets became popular from the 1940s and till date, it has its charm in mostly every male wardrobe. Nehru jackets are in trend even among women and girls these days. It was earlier known as ‘Band Gale Ka Coat’ meaning ‘Closed Neck Coat’. Achkan and Nehru jackets are more or less similar in design except for the length. The length of Achkan falls below the knees whereas Nehru jackets barely cover the hips. The most interesting fact about Nehru jacket is that Pandit Nehru never wore a Nehru jacket. The name of the jacket was inspired by the type of Kurta or Achkan he wore. Pandit Nehru was himself a fan of Sherwani and we usually wore a Sherwani. This brought the similarity in the names of the two outfits. Nehru jacket is a very elegant formal wear that can be worn over a collarless shirt paired with trousers though some people also wear a collared shirt too but it suppresses the look of the jacket. It can be worn over kurta pyjama that look classy and ladies can wear it over kurti. It is available in various fabrics such as brocade, khadi, silk, merino wool or cashmere depending upon the climate in which it is to be worn. So if you are looking for an elegant Nehru jacket for both men and women, you should visit Mulberry Lifestyle to shop it online. 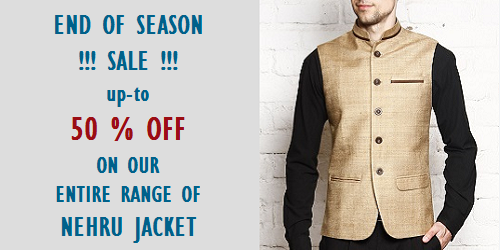 The Nehru jackets are available in all sizes S, M, L, XL and XXL. You can shop from various prints and looks of your choice. Mulberry Lifestyle is one stop shop for your entire ethnic look requirement. Shop with elegance without worrying about the fabric of the garment as Mulberry Lifestyle deals in quality products so that you are satisfied and it also offers easy browsing experience and hassle-free deliveries on time. Online payment and COD are also available. Enhance your look by shopping online from our wide collection of Nehru jacket at best price while sitting at home and enjoying the shopping experience at your comfort.